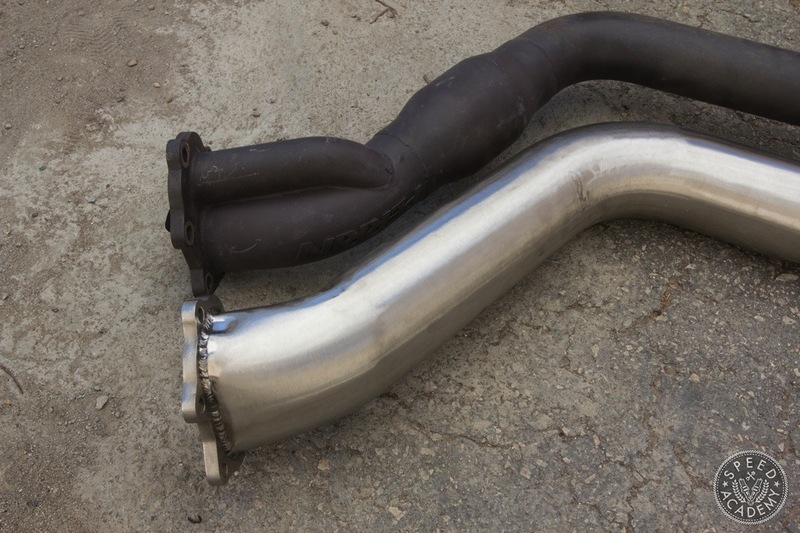 To allow maximum exhaust flow from the turbo, we found this massive bell-mouth Turbo XS downpipe. To give you an idea of how big this thing really is, the Perrin downpipe next to it is constructed out of 3-inch tubing. This is an earlier design from the company that is discontinued so it may be hard to find. Even though it may look like a mess of tubes and piping, everything works in harmonious perfection. 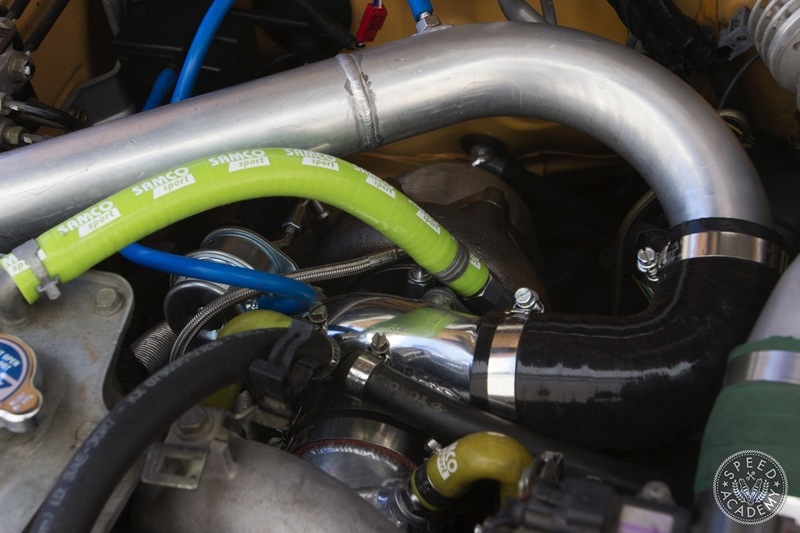 Props have to be given to ATP Turbo because their install kit makes this turbo upgrade a true bolt-on affair. 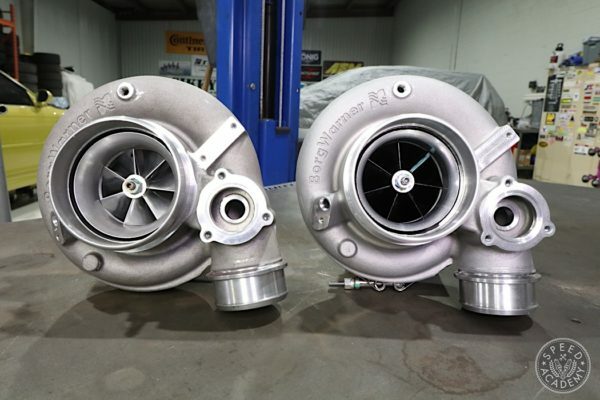 If you’ve ever tried to adapt larger aftermarket turbos you know how frustrating it can be when it doesn’t match up like stock, not the case here. Another quick yet custom mod we made was converting our old short-ram intake into a cold-air system. If you follow the inlet hose from the turbo, you can see how it disappears into the inner fender well. The air filter now sits behind the fog light hole where it picks up cooler ambient air than it would have in the engine bay. 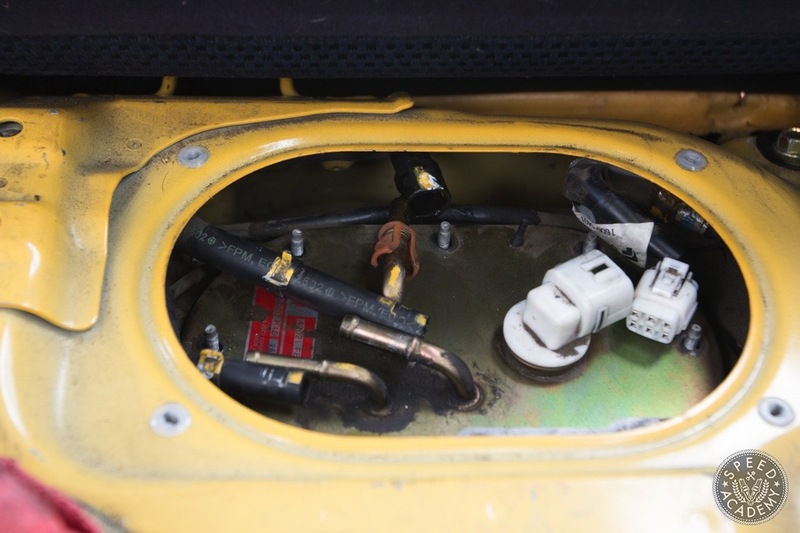 This relatively simple mod can help pick up power and more so reduce heat soak during hot laps at the track. In the future we have high hopes to do some E85 testing and see how the GTX2863R turbo performs on corn fuel. Hence, the decision was made to ditch our Walbro 255lph pump and step up to a DeatschWerks 65C pump capable of delivering 265 LPH. 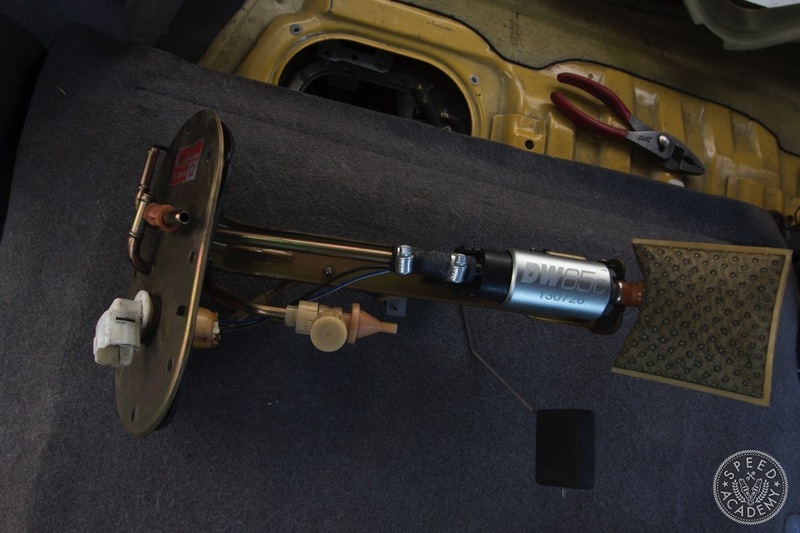 Having a little extra headroom with the fuel pump will help us sleep a little easier, especially when testing on E85. Accessing the pump is done easily through this access door behind the rear seat of the wagon. 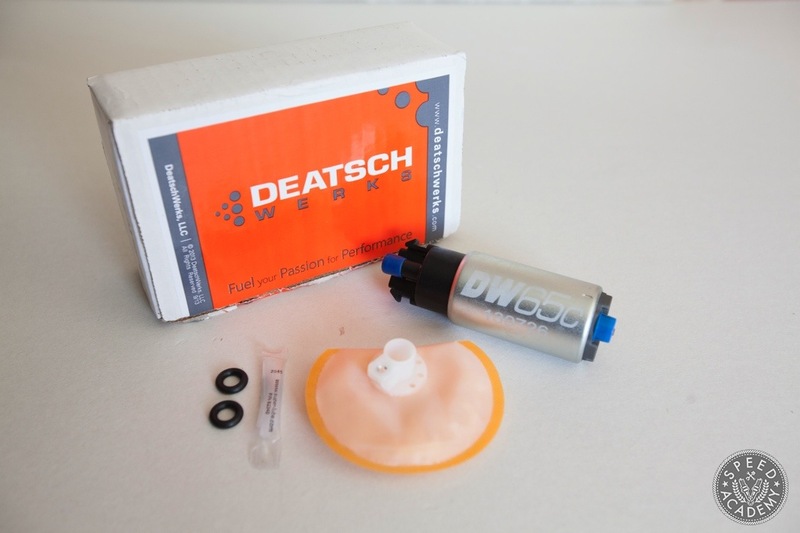 Installing the pump was slightly more difficult since DeatschWerks doesn’t actually offer a kit for the Bugeye WRX. We sourced the kit for an ’08 WRX and made it fit by using the sock filter from the old Walbro. The fitment wasn’t perfect but close enough that we felt comfortable with the setup. With our fueling needs met along with our turbo and camshaft upgrade complete, there was one order of business left. Tuning! And who better to maximize our new setup than Shawn Church Automotive Testing. His OG website should be a good indicator of how long Shawn has been around and tuning automobiles. He’s one of the premier go-to tuners in the Southern California area and someone I rely on for spot-on, reliable, and powerful engine tunes. As for what Shawn would be tuning with? 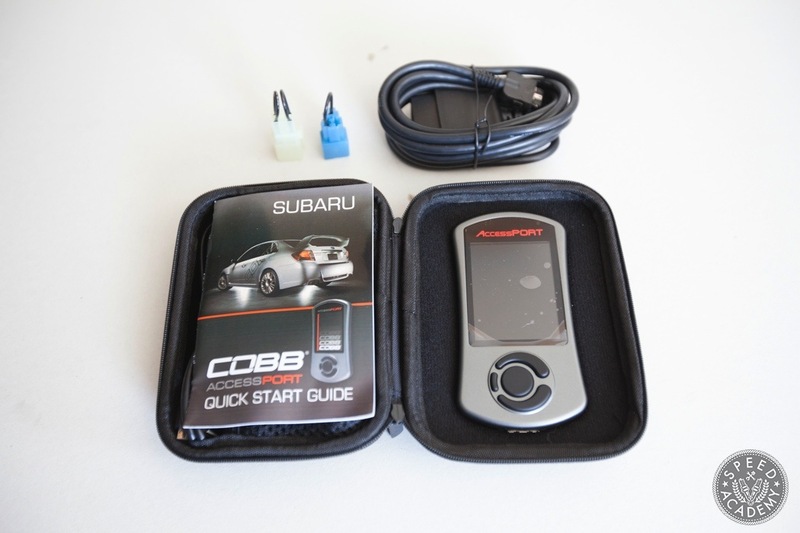 Cobb’s latest Accessport V3 ECU solution was the preferred choice. This powerful hand held device lets you load pre-tuned maps into the ECU or as in our case, custom mapping done by Shawn Church. Furthermore, it can be used as an engine monitoring device, read/reset trouble codes, shift light and even do performance measuring. If you’re a Subaru owner and you don’t have an Accessport you’re missing out! After a lot of anticipation and angst waiting for Shawn to finish his tune, the results were in. The dotted red line is the baseline before the upgrades with water meth injection and it made 309whp and 292ft-lbs. 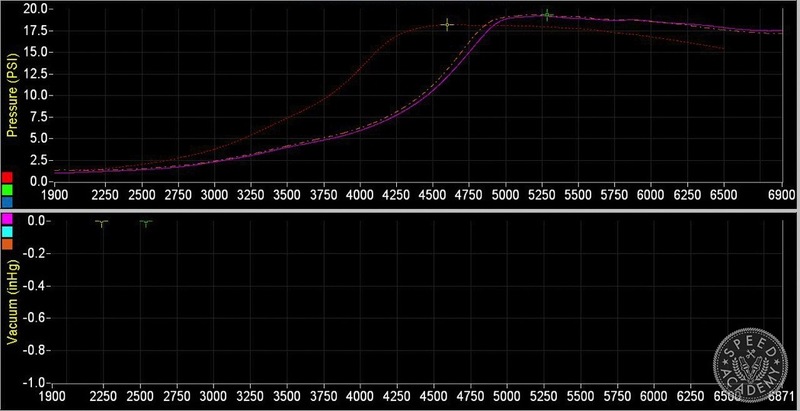 The Purple line represents the turbo/cam upgrade with water meth injection and a peak of 345whp and 311ft-lbs was achieved. Finally, the yellow dotted line is a 91 octane California piss water, err I mean gas dyno pull with the turbo/cam upgrade. 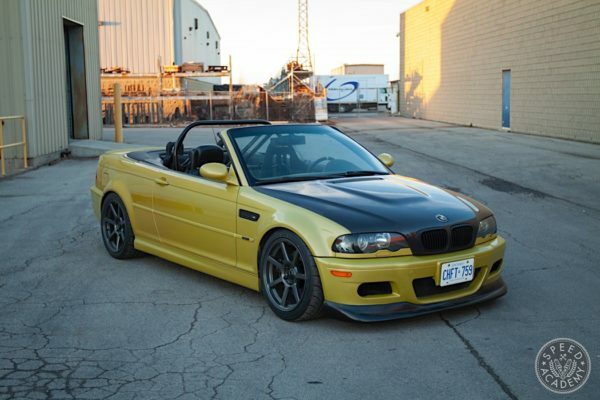 It peaked at 321whp and 293ft-lbs. 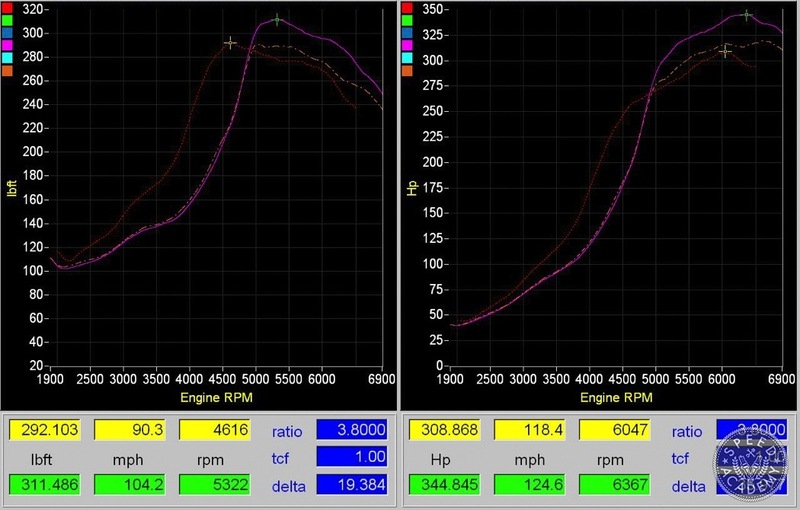 Here’s the boost pressure plot and despite boost being up just slightly (18psi vs 19psi) there’s only 1000rpm loss in spool up which isn’t bad at all considering how much more air the new Garrett GTX2863R can flow over the VF34. 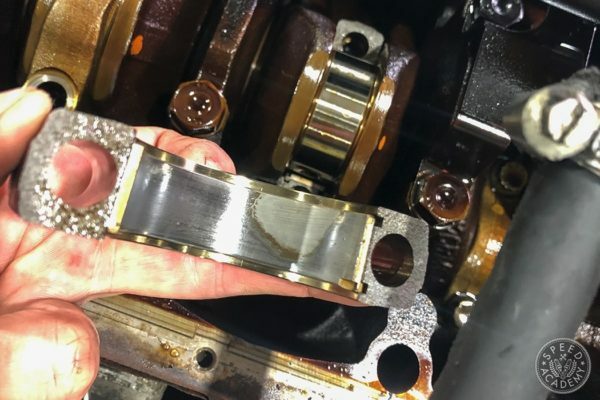 The front mount intercooler and ARC’s lengthy piping route between the engine and larger turbo aren’t helping reduce lag either, an upgraded top mount IC may be in the future to increase spool up. Having the extra 500 rpm on the top-end really makes a big difference though, as the engine feels like it’s being used at its full capacity now. What the dyno chart can’t and doesn’t show is how much more responsive the engine is now off boost and lower rpm partial throttle driving. 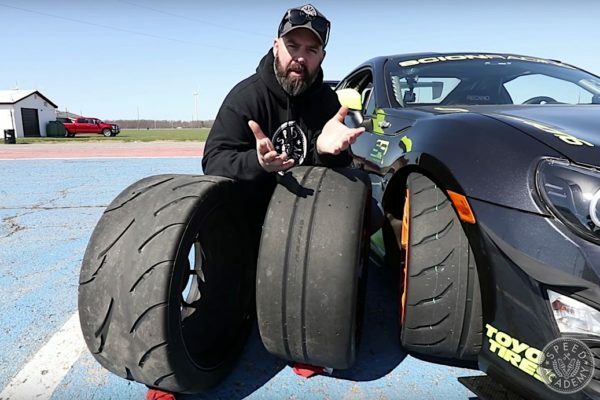 That’s part in thanks to Shawn’s great tuning ability, there’s no more lugging around and having to downshift 2 gears to get the car to accelerate quickly and sometimes that’s more important than peak whp numbers. Even though the WRX picked up a solid 36whp, Gary’s goal didn’t have anything to do with peak power but as I mentioned prior with better driveability and he couldn’t be more happy with the results. The WRX is now fun to drive and zips in and out of traffic, plus it’s got loads of power for some spirited pulls when Gary feels like stretching the Subaru’s legs. So remember, when you’re looking for a proper upgrade path bigger isn’t always better. 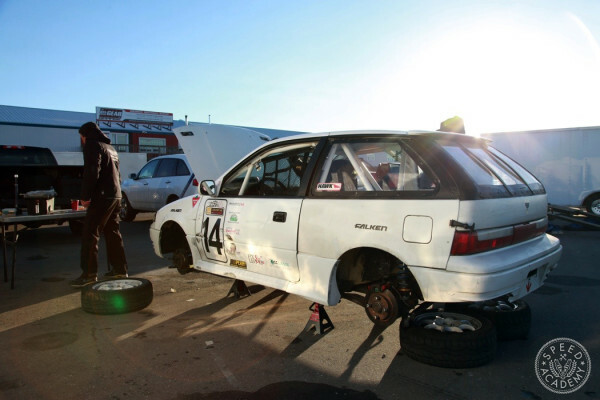 Figure out what your goals and needs are with your car and choose your mods wisely. The results can be similar to this and you won’t have to go through the headaches we did to reach it, do it once and do it right!